Right Now is an international coalition of Jews and allies who are advocating for the rights of the African asylum seekers in Israel through awareness-raising, grassroots campaigns and direct advocacy. We ask Israel to develop an asylum process consistent with the Refugee Convention, one that would respect the dignity of asylum seekers, protect their human rights, and facilitate meaningful and impartial determinations of refugee status by the government of Israel. Right Now launched in July of 2012. Coalition members include Eritrean and Sudanese asylum seekers living in Israel, individuals and Rabbis in Tel Aviv, Jerusalem , Los Angeles, New York, San Francisco, Minneapolis, Chicago, New Jersey and elsewhere in the U.S., as well as a number of international organizations. 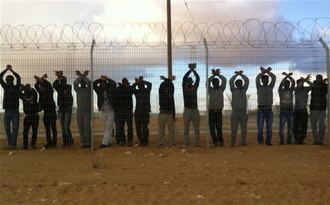 Israel is home to 45,000 asylum seekers who arrived in Israel from Africa through Sinai. Although 80%-90% of such asylees would be eligible for refugee status in European nations, and the residency and work permissions it affords, the Israeli government has refused to examine their applications. Kept in poverty, African asylum seekers have become frequent scapegoats for unsubstantiated charges of causing crime, unemployment, and a threat to a Jewish majority. Since its founding, Israel has dealt ambivalently with the prospect of non-Jewish immigrants and foreign residents. In recent years, as strife and genocide displaced hundreds of thousands in Africa, Israel’s public debate has become increasingly hostile to “infiltrators.” Legislative initiatives to round up, jail, and even deport asylum seekers have been repeatedly struck down by the High Court as anti-democratic. Meanwhile, numerous Israeli NGOs advocate in the courts, legislature, and media for asylum seekers’ rights. Go to our Policy Recommendations page to learn more. Learn more about the history of Israel's refugee crisis from Hotline For Migrants and Refugees, one of our Israeli partners.